With so many activities on offer, figuring out the best things to do in Bangkok can be a daunting challenge. Thailand’s vibrant capital boasts some of the world’s top markets, temples, food and lively nightlife. After living in Bangkok for years, here are my favourite things to do in the city, including some top restaurant recommendations. 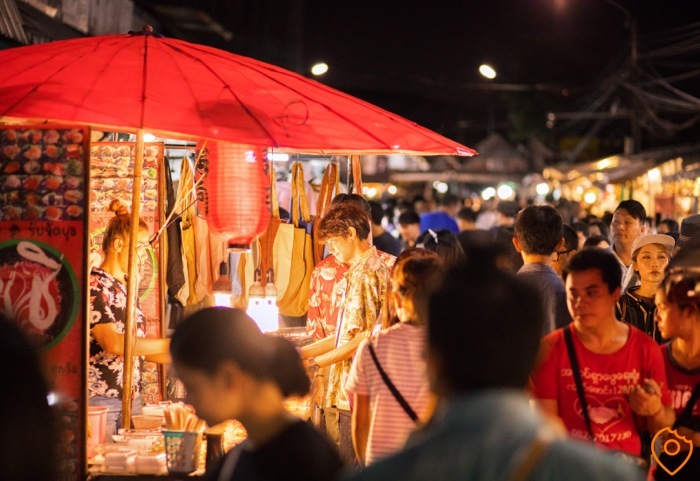 With over 15,000 stalls drawing between 200,000 and 300,000 visitors a day, Chatuchak is the largest weekend market in the world and something you have to experience. You can find everything from art, food, clothes, antiques and jewellery at Chatuchak and it’s a great spot for souvenir shopping. Don’t forget to barter, as you can get just about everything here for a lower price. Wander deep inside the market as shops around the main walkway, especially those with more premium items like leather or sculptures, are likely to be more expensive. Chatuchak’s art section is our favourite, featuring beautiful paintings and handicrafts from several Thai artists. The heat and crowds can get a bit overwhelming, so we recommend visiting Chatuchak in the morning, or later in the afternoon. Viva 8 is a good spot to cool down, a trendy lounge bar serving delicious Paella (160 THB), ice cold beers (120 THB) and enticing cocktails (220 THB). Chatuchak Weekend Market is open on Saturday and Sunday from 9:00 till 19:30, a limited selection of shops is also open on Friday. A more detailed overview of how to get around in Bangkok can be found in our Bangkok Public Transport article. 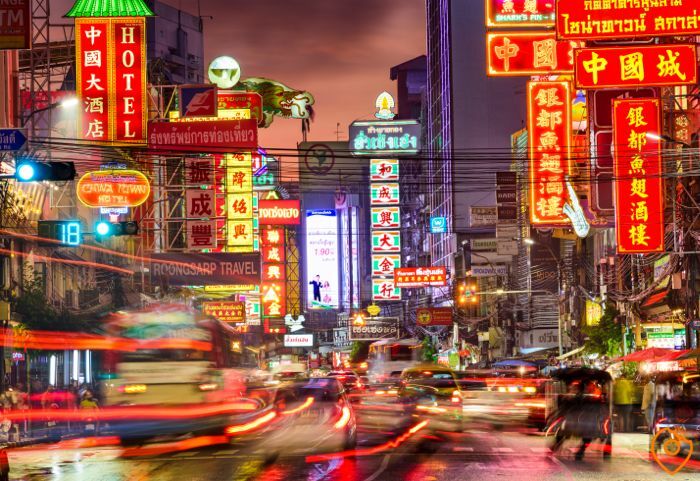 One of our favourite activities in Bangkok is to visit Chinatown at night. After about six, when the street food vendors are allowed to set up their carts (except on Mondays), this famous street transforms into a foodie paradise. Imagine fiery woks, bustling crowds, the smell of spices and bright neon lights. Wander around on Yaowarat Road (Chinatown) or one of Yaowarat’s Soi’s and eat until you drop. Afterwards, head to nearby Soi Nana Yaowarat (don’t confuse this with Soi Nana Sukhumvit) for some beers and cocktails. We especially like the rooftop bar Wallflowers Upstairs, gin bar Teens of Thailand or cocktail bar Asia Today. Chinatown Bangkok at Night - a must visit! - Treat yourself with a Thai-Chinese dessert at well-known street food cart Sweetime or popular dessert ship Aaii Waan Yen. 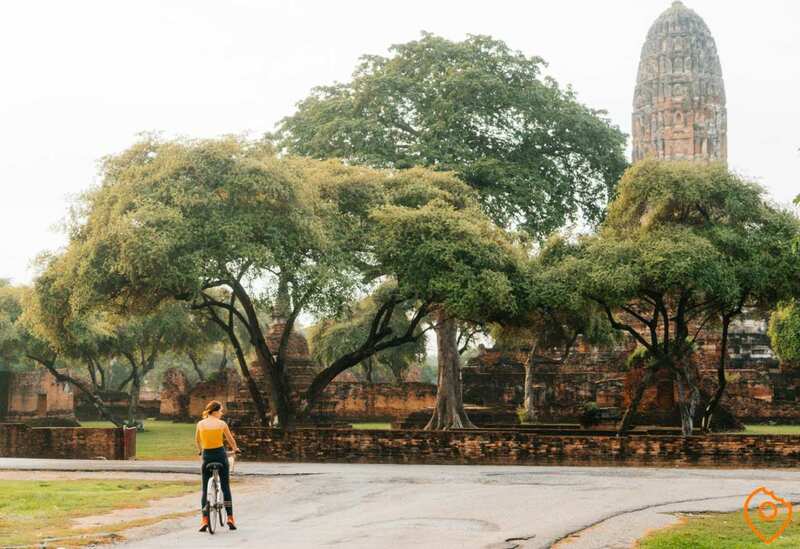 Bicycle tours in Bangkok are a great way to experience an authentic slice of city life and therefore one of the top things to do in Bangkok. Cycle through small alleys, over canals and pass by local markets and rice fields. 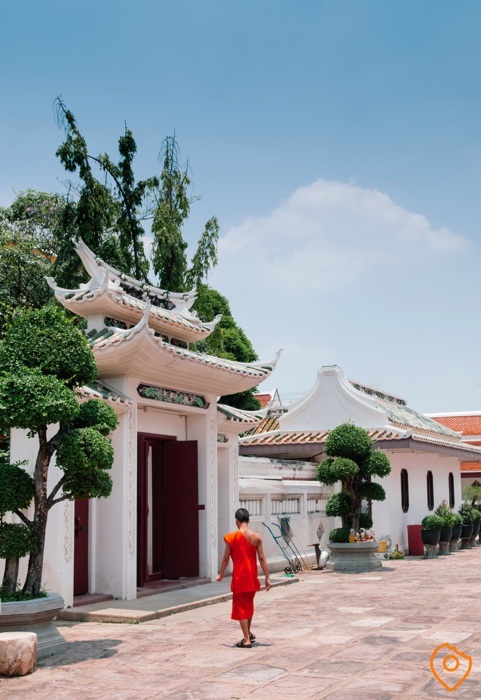 Discover daily life in Bangkok away from the main tourist hot spots, spotting traditional Thai houses and children playing hide-and-seek in temples along the way. Recommended companies include the original bike tour Co van Kessel and Grasshopper Adventures. They offer half-day, full-day and night tours led by experienced guides. While the day tours will take you further from the tourist spots, you can see some of Bangkok’s most beautiful spots lit up on a night tour. Driving through the "jungle of Bangkok"
Avoid Amphawa and Damnoen Saduak floating markets, which require a full day-trip from Bangkok and are packed with crowds and vendors selling touristy souvenirs. We prefer peaceful Taling Chan Floating Market, which is much smaller and has an authentic Thai feel. The market lies just 12km from the heart of Bangkok and is reasonably priced. Explore two sections, the mainland area which is filled with stalls and the floating section with food vendors serving meals from their boats. Read more about Taling Chan Floating Market. - Order grilled salted sea bass, grilled shells with shallots or other grilled fresh seafood from one of the boats in the floating section. 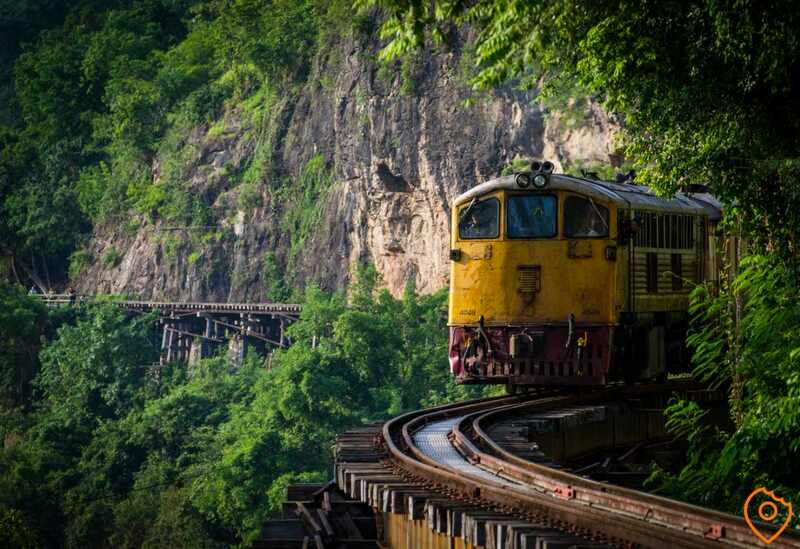 Our favourite is Pla Pao Talat Nam Taling Chan, which is the second closest boat to the railway. - Try traditional Thai desserts like Khanom Bueang at Mae peak in the mainland market or Khanom Thuay at Pa Boon in the floating market. Bangkok is one of the few cities on earth where it seems completely normal to place a bar on top of a building. There are hundreds of rooftop bars dotted throughout the city, some set at dizzying heights above The Big Mango. Come with friends or family to enjoy a drink in chic surroundings with spectacular views and music. For cheaper options, visit during happy hour, which often falls around sunset and is great for skyline views. Octave – offers 250 THB Beers and 390 THB Cocktails. Happy Hour is from 17:00 to 19:00 when cocktails are 'buy one, get one free'. Moon Bar – serves 280 THB Beers and 490 THB Cocktails. Happy Hour falls between 17:00 and 19:00, with 'buy one, get one free cocktail'. These two bars have the most spectacular, 360-degree views of the city. “Sky Bar” at Lebua, which used to be my favourite, also has a superb view. However, since it featured in The Hangover 2 movie, it’s so busy you can barely stand. Lebua is also more expensive, with 690 THB cocktails and no happy hour. Most rooftop bars have a dress code, which means flip-flops and singlets aren’t allowed and guys should wear pants. Sukhumvit Soi 11 – favourite clubs here are Levels and Insanity. Oscar and Above Eleven are great for pre-drinks and Latin bar Havana Social is also a good option. 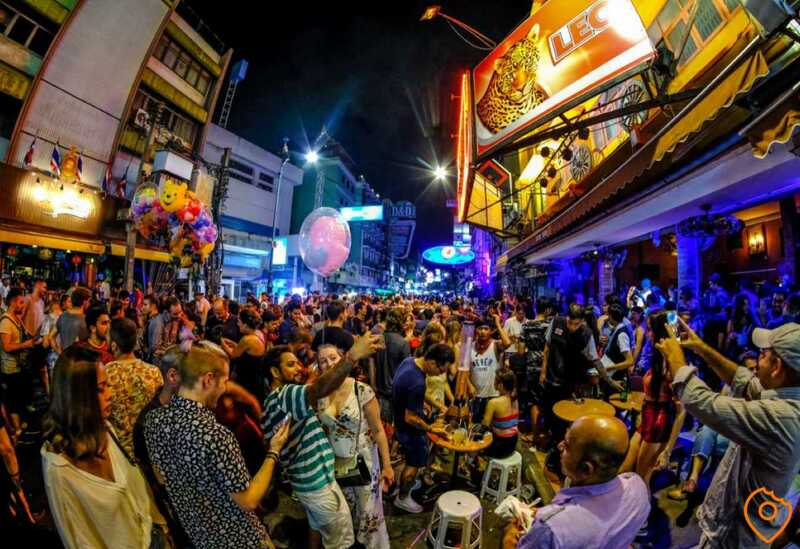 Silom (LGTB) – popular bars include Dj Station and G.O.D. Enjoy pre-drinks and karaoke at Telephone Pub. Bear in mind that the military banned all clubs from staying open after 2:30 AM, but Mixx is open the latest. Many taxis will give you a free ride to Mixx as they get a commission for bringing in customers. Bangkok also offers some great pool parties every weekend. The most famous one is the So Sofitel Pool Party which is held every last Saturday of the month at the infinity pool of So Sofitel Bangkok, which features stunning views of the skyline. If you’re in Thailand during Songkran (the Thai New Year) which is from 13 till 15 April, Bangkok transforms into one big water fight. The main party zones during Songkran are RCA, Khao San Road and Silom. The water festival S2O is also a great party option. More information can be found in our Ultimate Songkran Guide. 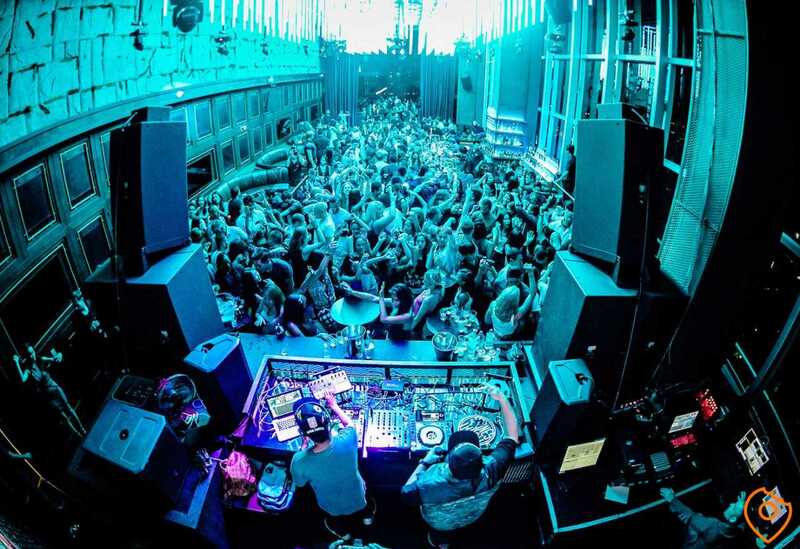 For more details, check out our Bangkok's Nightlife Article. - Legendary Pochana 55, which is open till four in the morning. 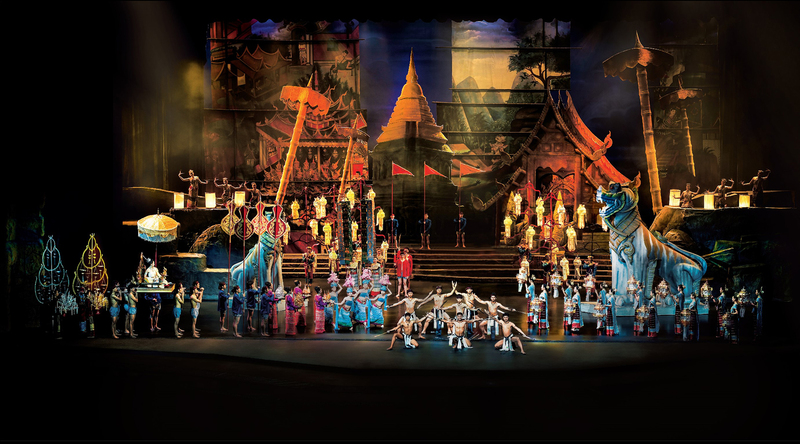 Be amazed by the ever-changing Siam Niramit show, set in the huge, 2,000-seat Ratchada Theatre. Every night, Siam Niramit tells the story of Thailand and its colourful culture in three acts: Thai history, religion and Thai Festivals. Learn about Thai hell, heaven, karma, and many more cultural topics during the show, which boasts 150 performers in 500 lavish costumes, as well as jaw-dropping special effects. Expect boats on stage, flying dancers, people swimming, spectacular stage sets and even real elephants. Although a bit pricey, starting at 1,500 THB per ticket, this is the most spectacular show we’ve ever seen. Both times we visited we easily booked seats through online resellers for 1,200 THB, which we found on Google. 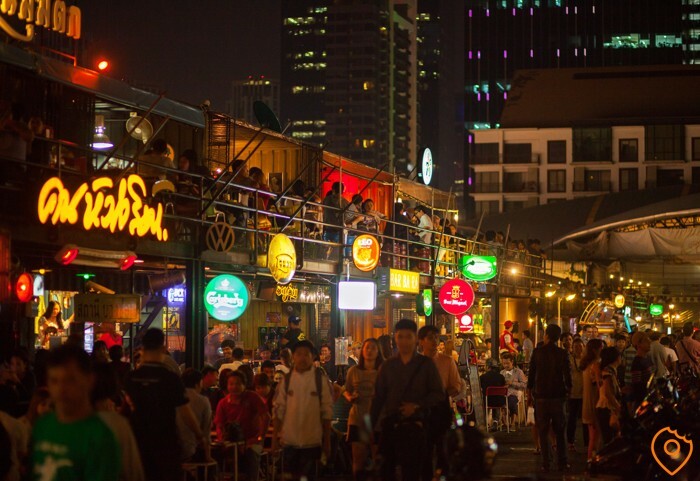 The popular train market Ratchada and all its bars, food and merchandise is just a 15-minute walk or two-minute taxi ride away from Siam Niramit’s Ratchada Theatre. In the next paragraph, we recommend the best food at Train Market Ratchada. You’ve probably already seen the pictures of this lively market and its colourful tents. 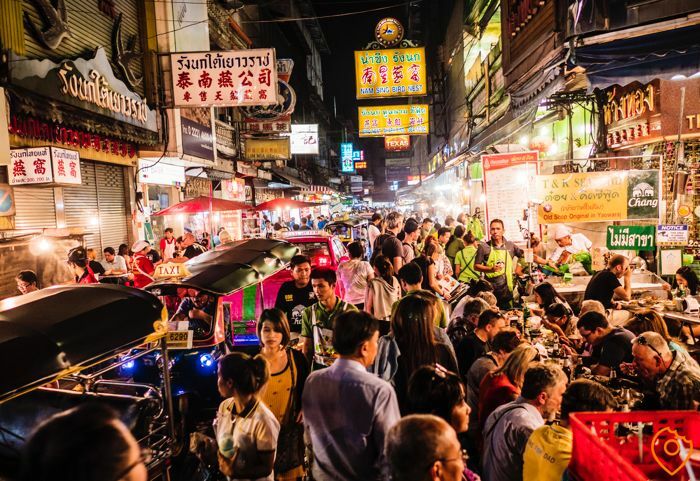 Visiting Ratchada (also called Rot Fai Market, meaning Train Market in Thai) is one of our favourite things to do in Bangkok at night. The market is incredibly popular among locals and was originally set in an abandoned railway station in Chatuchak district, which is closed now. The new location is very accessible, set in the city centre next to Cultural Centre MRT. 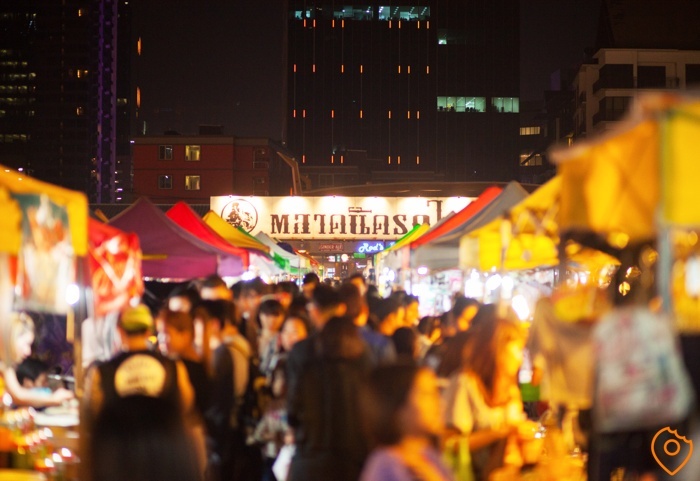 Train Market Ratchada comes alive at night from Tuesday till Sunday and is divided into three large zones with bars, food and shopping. Our favourite is, of course, the food section, where you can find everything from Japanese takoyaki to Western ribs, and lots of Thai and Thai fusion dishes such as seafood, som tam, grilled chicken, skewers, desserts, candies, rotis, fresh coconuts, smoothies and more. At the merchandise zone, you’ll find your usual bargains such as phone cases, clothes and electronics. After you’ve eaten and shopped, head to one of the many bars to enjoy a cheap beer or cocktail. Many boast live music bands and have a rooftop area where you can enjoy the colourful view. Frankfurt Bar has live music bands playing all night, while Sorry I’m Gay and Dot Box are our favourites. For more information, check our dedicated article about Train Market Ratchada. Tip: the market has another popular branch slightly outside of the city centre - named Srinakarin - that specialises in vintage goods but doesn’t have so many food and drink options. - Delicious seafood buckets at the popular Holy Shrimp! - Eat until you’re stuffed at Train Market’s large food zone. Bangkok is the Muay Thai capital of the world, so we highly recommend you attend a real Muay Thai fight when you visit. Experience roaring crowds cheering and gambling on their favourite professional Thai boxers. These skilled athletes mostly come from the poorer Isaan region and often fight to support their family. Each night hosts around eight fights that begin with a ceremonial dance also known as Wai Kru Ram Muay, which shows respect towards the boxer’s teacher and parents. Bangkok’s two major Muay Thai stadiums open on separate days. On Monday, Wednesday and Friday you can witness fights at Rajademnern Stadium and on Tuesday and Thursday, you can watch in military-controlled New Lumpinee Stadium. There is also a free match on Sunday afternoon at Channel 7 Stadium, which is broadcast live on television. Although locals pay much less, tickets for foreigners cost 2,000 THB for ringside seats or 1,500 THB for lower-tier seats. Sailing the canal network in Thonburi is a great way to experience how Bangkok, nicknamed The Venice of the East, used to be. Time stands still here and you’ll find stilt houses, colonial mansions, old bridges, collapsed docks and a slower pace of life. Huge monitor lizards sunbathe on the shores and Thai people stop to feed the fish. To explore these waterways, we recommend you rent a long tail boat through an agency, as dealing directly with boat drivers near tourist hotspots can be a hassle and many will overcharge. Book through an agency for a more professional experience and an English-speaking guide. We recommend Small Teak Boat Canal Boat Adventure (no paid endorsement). Trips cost 1,695 THB for three hours. 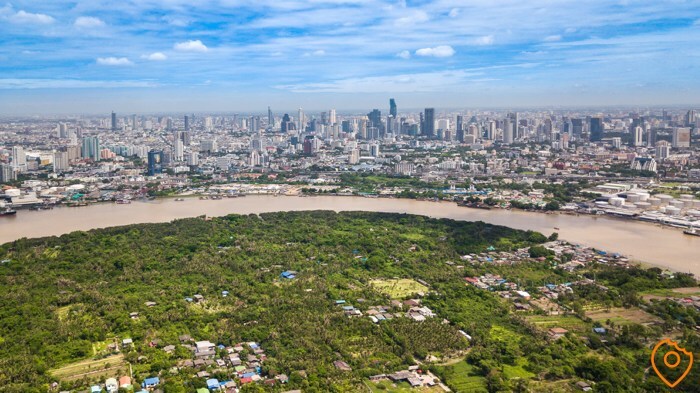 Surrounded by the Chao Phraya River, this “island” is Bangkok’s greenest neighbourhood. Bang Krachao (also called “The Green Lung” or “Pig’s Stomach” due to the shape of the island) is a unique getaway that transports you from one of world’s busiest cities to what feels like a remote Thai village. 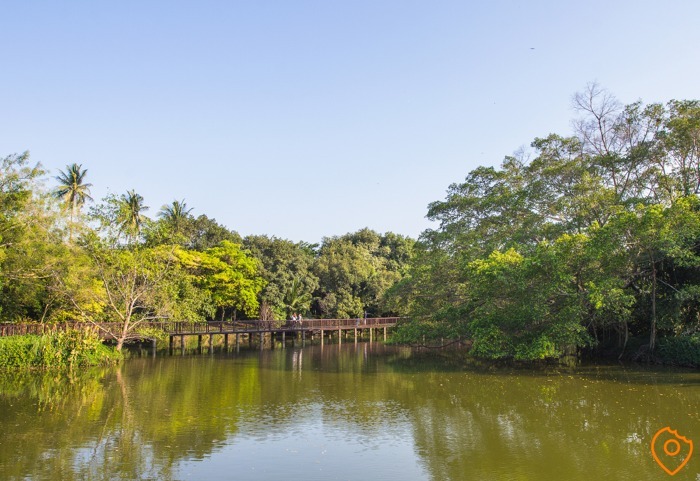 Bang Krachao is even more of an oasis than Lumpini Park, with temples and a small floating market at weekends, as well as beautiful scenery and wildlife in Sri Nakhon Kuen Khan Park. The best way to get around the island is by bicycle, which you can rent for 100 THB next to the pier connecting Bang Krachao with Mainland Bangkok (Klong Toei and Bang Na pier). The whole trip is easy to organize independently and you can spend a half day or more on this relaxing island. Even for Asian standards, Bangkok is well-known for offering quality spa treatments. Thai massage is one of the most popular forms in the world and a great way to relax after an intensive day of sightseeing. Traditional Thai massage is oil-free and you’ll be asked to dress in loose pyjamas. The therapist will stretch, compress and bend your body into many different positions, using their weight to put pressure on different muscles. A full Thai massage experience might take of up to two hours and will treat the whole body including fingers, feet and ears. Because of the unusual positions and close contact, some first-timers might be a bit uncomfortable with this massage technique. If you want to get the most of it, just relax and go with the flow. For a less intense experience, you can have an oil massage instead which doesn’t involve extreme stretching. - Wat Pho Traditional Thai Massage which is the epicentre of Thai Traditional Massage and a good option after a visit to the temples. Check our app TopTravelFoods to find good restaurants near your chosen spa. 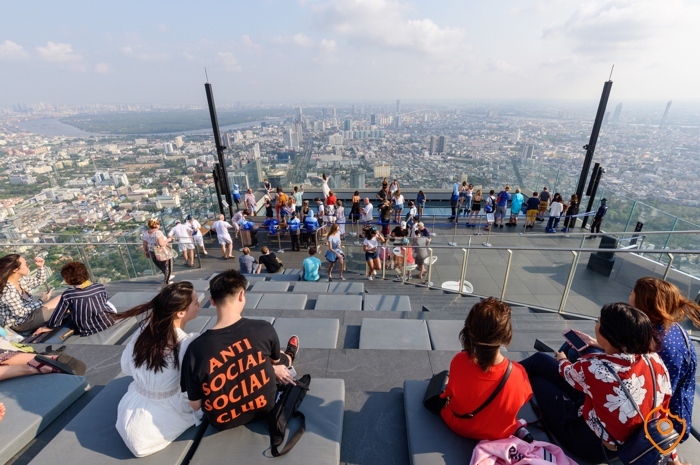 One of the top things to do in Bangkok is visiting the Mahanakhon Skywalk. 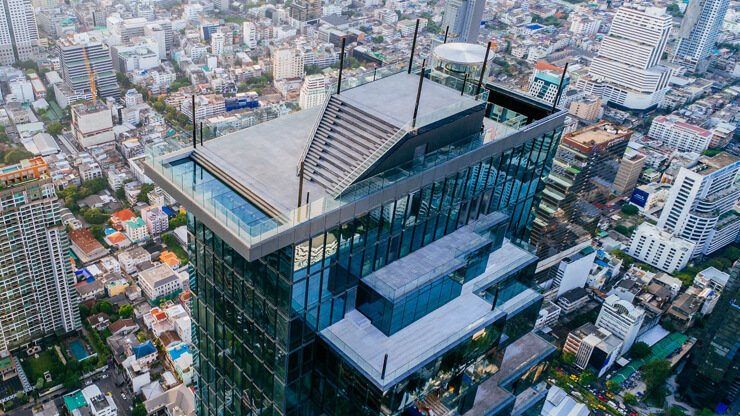 You might have seen this unusually shaped tower called the Mahanakhon Tower - also known as the Tetris building - in pictures or even spotted it at Bangkok’s skyline. On top of this building, you will find a rooftop deck and skywalk. The skywalk hangs over the building, which is 314 meters high and has a glass floor where you can stand on and see the traffic under your feet. This bizarre experience is something that you will not forget the rest of your life. Obviously, you can enjoy a 360 degrees view of the city on the top deck, where you can also find a small bar to enjoy a cocktail or a beer. Before you head up to the deck, you can also enjoy a 360-degrees one floor underneath the deck, which makes you feel more comfortable of the height. On your way out of the building, you will go through a maze of duty-free shops. It’s pretty difficult to find the exit, which they do on purpose. It’s a bit annoying, especially as you pay 1,000 baht entrance fee. Most visitors prefer to visit the tower during sunset, but during day-time, you have a better view of the city. Bangkok is a gateway to top attractions like Ayutthaya, Kanchanaburi, Lopburi and Khao Yai National Park. All of these destinations are within a day’s reach and perfect for escaping the intensity of Bangkok. 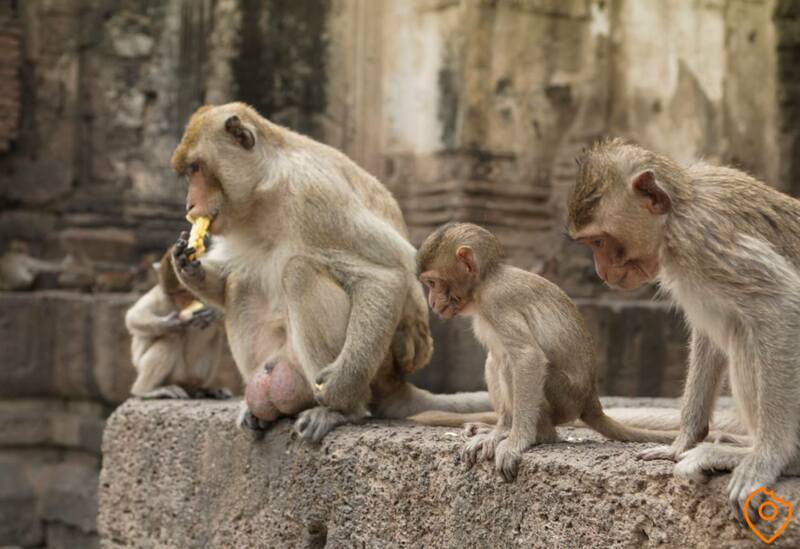 Ancient Ayutthaya can be reached by train from Hua Lamphong Railway Station in under two hours while you can get to the famous monkey temple town, Lopburi, from Hua Lamphong Railway Station in around three hours. Trains to Kanchanaburi and the River Kwai Bridge leave from Thonburi station and head straight over the famous bridge, taking up to three hours. If you want to cross the Wampo Viaduct as well, travel a bit further to Wang Po. 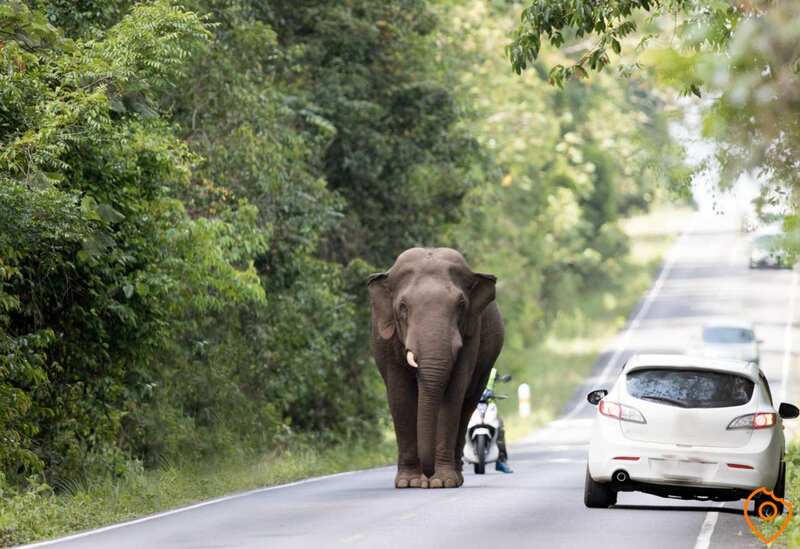 For Khao Yai National Park, it’s best to book a tour from Bangkok if you want to get the most out of this experience. - Ayutthaya is famous for its Boat Noodles which are best served from Krung Kao Boat Noodles. - Visit Ayutthaya’s popular fresh seafood market and try giant river shrimp or other seafood delights. For more information check our Day Trip to Ayutthaya article. In case you haven’t noticed by now: we’re major foodies. Have you ever heard of Goong Ob Woon Sen, Gaeng Keow Wan or Pad Krapow? Don’t worry, we hadn’t either when we first came to Thailand, in fact, we hadn’t even tried Pad Thai! Living in Thailand has changed all that and inspired us to launch a food app, TopTravelFoods, to help people figure out where to try the best local dishes. Many first-time visitors end up at touristy restaurants, ordering the same meals over and over again, but Thailand has so much more to offer than just Pad Thai. Picture yourself eating at an authentic Thai restaurant away from the tourist hot spots, having the meal of your life for just 100 THB! To give you a better idea what kind of restaurants we are talking about, check out our Top Local Thai Restaurants article. Download the TopTravelFoods app to find famous restaurants across Thailand. We don’t feature paid advertising or fake reviews, just the best food rated by fellow travellers.